Smoky flavors, spice, and everything nice that's what the Spicy Jalapeño Jack Burger is made of. I have been longing for some good Mexican flavor in my burgers! The Knock Your Boots Off Tex-Mex Burger is really delicious. But, I am looking for some chile' spice! It is time to kick up the heat in this place. 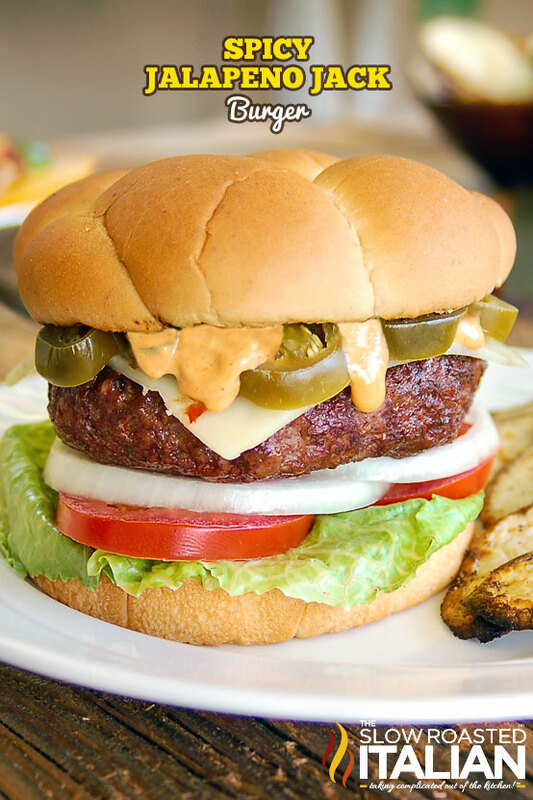 This Spicy Jalapeno Jack Burger will certainly wake up your taste buds. This burger is a Mexican inspired creation that starts off with a smoky and spicy beef patty over a bed of crispy lettuce, tomatoes and onion; with incredible layers of heat and flavor on top. The spiciness and creaminess of the pepper jack cheese pulls the flavors together, topped with pickled jalapenos and spicy barbecue ranch sauce, this is the burger you have been waiting for. This is so amazing, I am considering this as the feature dish at our Labor Day party this year. The simplicity of the layers of this burger come together to create exactly what your tastebuds are craving! Mix ground beef, ancho chile powder, chipotle chile pepper, chile de arbol, salt and pepper in a large bowl. Portion and form into patties slightly larger than your bun. Make a slight indentation in the center of the burger to prevent it from doming up in the center. The indentation will rise as your burger cooks. Grill until golden brown and slightly charred (about 3-5 minutes), turning once (cook for 3 minutes on the other side for medium). Try not to press down on your burger with a spatula. It will cause the juices to escape and will create a dry burger! Spread spicy barbecue ranch sauce on bottom bun, add lettuce, tomato and onion to taste. Place burger on top and a slice of cheese, add jalapeno slices to taste. Top with more spicy barbecue ranch sauce. Serve and enjoy! This looks great, Donna. I know that Sean would be all over this jalapeno version. Donna my husband would love to eat in your kitchen. He adores burgers and this one has his name all over it. You really have a gift when it comes to making the most delicious looking hamburgers! Spicy is my favorite. oh my gosh my mouth is watering!! yum! That looks so so good...Hungry now! >.< That would be a dream to open up my own Bakery. I just bake for my family and friends. Looks phenomenal! What a gorgeous looking burger. Yum! Fantastic and spicy too. nommmmmm! My daughter and I both think this looks amazing! Ummm, mmm! It looks and sounds like a fantastic burger! Thanks for the recipe! Good lord girl this has to be the best looking burger photo ever! you should sell it! GORGEOUS! Wow! It's a delicious monster! I love it! A thing of beauty! Your half pound burgers are always so well formed and look perfectly cooked. I can’t seem to find the recipe for the spicy ranch bbq sauce anywhere. Could you please direct me to it? This recipe looks amazing!